Summary The project consists of 56 semi-detached houses, developed by Bouwfonds in Amersfoort. The houses meet the strict environmental requirements for the Nieuwland area as dictated by the local authorities. Waterwijk is also part of the EC 1 MW photo-voltaic project initiated by the utility company REMU. 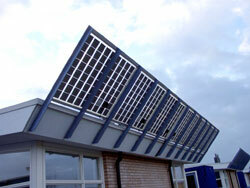 In this design we made a 'PV-spoiler' at the edge of the roof. Approximately 4 m2 of transparent panels with photovoltaic cells have been included in the eaves of these houses; in the north facade of the building, with the PV-cells oriented to south. Since the PV systems can also be seen from the north side, transparent panels have been used.